HASSAN ROUHANI, President of Iran, mourning the loss of thousands of Muslim pilgrims and hundreds of its citizens who had come together in the global gathering of the Hajj, called on Saudi Arabian officials to grant immediate consular access for the expeditious identification and return of bodies, as well as to prepare necessary conditions for an independent and precise investigation. Recalling that, two years ago, his country had voted for constructive engagement with the world, he said he could now proudly announce that “a new chapter had started in Iran’s relations with the world”. The same national will, which had given him the mandate for consolidating peace, had manifested itself through a diplomatic effort resulting in the Joint Comprehensive Plan of Action between Iran and “the six world Powers”. That instrument set a strong precedent illustrating that two sides, rather than negotiating peace after war, had engaged in dialogue before the eruption of conflict. Recognizing the role of all negotiators with his country, including from the United States, United Kingdom, France, Russian Federation, Germany and China, he said that multilateralism and win-win solutions should be the basis of engagement. While the United Nations had not been successful in most cases in sustaining global peace and security, he said that “this time […] the United Nations made the right decision”. Security Council resolution 2231 (2015), despite significant shortcomings, was an important basis for terminating sanctions against Iran, which had been unjust and illegal. The nuclear deal, a brilliant example of “victory over war”, should herald a new era and lead to positive outcomes regarding the establishment of sustainable peace and stability in the region. Noting that the gravest threat to the world today was the potential transformation of terrorist organizations to terrorist States, he said Iran was prepared to assist in eradicating terrorism and paving the way for democracy. Just as the country had aided in establishing democracy in Iraq and Afghanistan, it was also prepared to help bring about democracy in Syria and Yemen, he said. 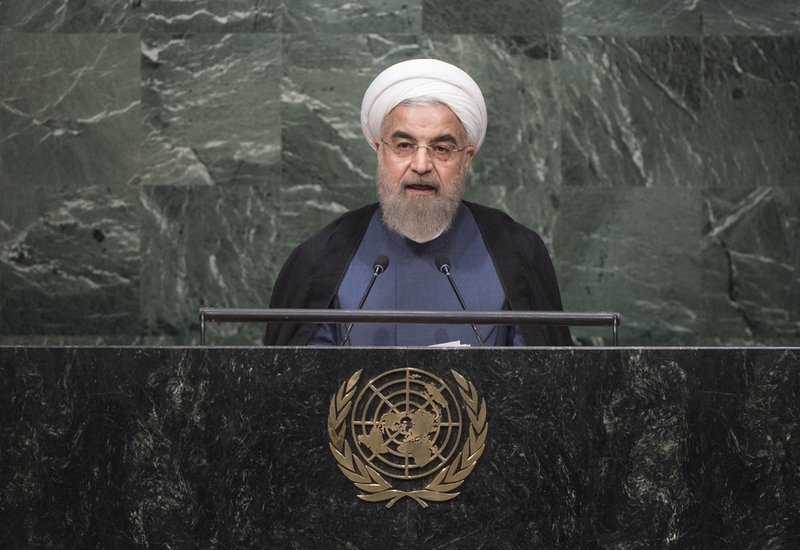 Iran had not only sought a nuclear deal through the joint action plan, but a new and constructive way to recreate the international order based on mutual respect and non-intervention in States’ internal affairs. Regarding the “shattered” Middle East, he advocated for a joint comprehensive action plan to create a united front against extremism and violence. The roots of today’s wars, destruction and terror could be found in the occupation, invasion and military intervention of yesterday, he said, remarking that: “If we did not have the US military invasion of Afghanistan and Iraq, and the its unwarranted support for the inhumane actions of the Zionist regime against Palestine, terrorists today would not have an excuse for the justification of their crimes.” Despite the many problems in the Middle East, however, he expressed hope in a promising future and in the will of nations to pick the path of goodness and purity. Also speaking in exercise of the right of reply, the representative of Iran said that once more today the representative of Israel had demonstrated how much he grieved the loss of the “smokescreen” that the country had used to hide its crimes in the Middle East. He had attacked all members of the international community for their support of a nuclear deal that would “remove a layer of tension” in that region. The support that Israel provided to ISIL in the Syrian Golan showed that it wished to keep tensions high, because peace and stability in the region was an “existential threat” to Israel. The spotlight would be back on them and their crimes. The Israeli regime and its cronies had done much to prevent the nuclear deal from succeeding, but they had failed. Iran was committed to faithfully fulfilling its obligations under that deal. Also exercising the right of reply, Iran’s speaker said Bahrain’s representative had repeated and fabricated allegations that Iran was meddling in that country’s domestic relations. Those fabrications only amounted to desperate efforts to cover Bahrain’s rule of its minorities and its trampling of the majority’s meaningful participation in running the country. She said that remarks made by the delegate of the United Arab Emirates about the Hajj tragedy had also been unwarranted and unhelpful, as that issue was “none of their business”. In addition, comments made over the disputed body of water situated in the Arabian Peninsula had been politically motivated, she said, adding that geographical disputes had only caused tension and that Iran had always pursued a “policy of friendship” with its neighbours and was ready to engage in bilateral talks with the United Arab Emirates to remove any misunderstandings between the two counties. She also rejected the speaker from Canada’s distortion of facts and his delegation’s “policy of Iranophobia”. Canada had a very questionable human rights record with indigenous people and in supporting Israel’s crimes against the Palestinian people, she said.